On Jan. 29, 2013, Salt Lake Community College presented Jack Hesleph, Ruby Chacon and Rt. Rev. 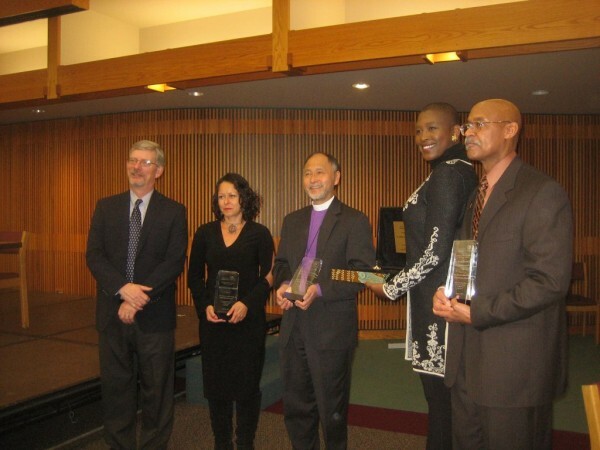 Bishop Scott Hayashi with the 2013 Martin Luther King Humanitarian Embracing the Dream Award. After the ceremony, the three award winners participated in a panel discussion with keynote speaker Michele Goodwin. Among the things that the panel discussed was the treatment of President Obama. Goodwin says that the problem of racism can be seen in people’s responses to the president. “When there are death threats against the president and his family not for policy but centered around the fact that he is African-American,” says Goodwin. Hayashi likens the situation to Plato’s and Tolkien’s ring of invisibility. Plato believed that if a person was given invisibility, he would become immoral and unjust. The internet has given people the power to be invisible and to be immoral through that anonymity. “The president keeps saying ‘We are a better people than this,’ and we are,” says Hayashi. The award ceremony and the panel discussion ended a weeklong celebration of King’s legacy. The conversation will continue with the next Conversations on Social Issues in February.